The Best In Game-room Furniture and Man Caves! 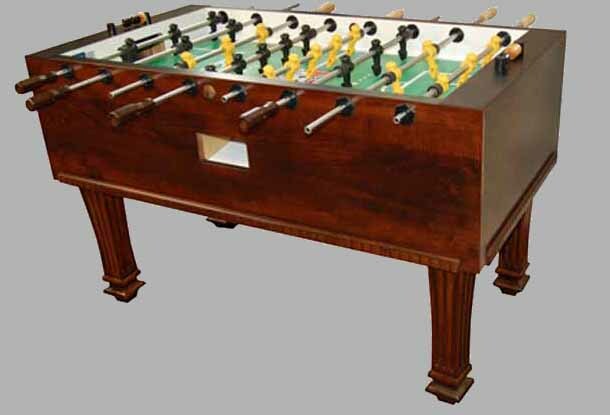 We pride ourselves in offering the best in indoor game-room furniture. Please take a moment to browse our site and view the various gaming tables and other pieces of furniture to complete your indoor gaming experience. We supply Southern Louisiana with the highest level of quality and craftsmanship in the industry standards. It's what our customers have come to expect of Indoor Recreation. We offer delivery and installation services to make the implementation of your new recreation area as easy and care free as possible! EXCEEDING EXPECTATIONS! **Not All of the products we offer are shown on our website. If you have any trouble finding what you are looking for, please contact us and we'll do our best to help. 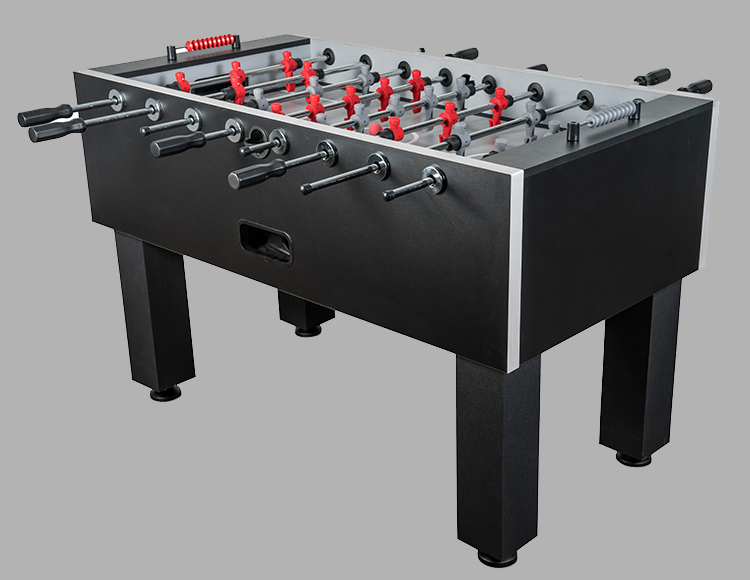 The Brunswick Kicker is an exclusive sturdy cabinet with a matte black finish foosball table that has a three-man goalie that offers a wall of defense and incredibly fast play. It contains adjustable leg levelers that make installation and leveling easy on uneven floors. section for better ball control and passing. Color-keyed, super high grip, interchangeable handle system exclusive to Tornado. The Tornado Worthington showcases the classic and attractive finish of Champion's Worthington Shuffleboard, coupled with the play ability of Tornado's Elite. Featuring a furniture-grade wood finish, dual ball returns, heavy gauge rods, and Tornado's patented split bearings for easy maintenance and professional play quality. Black and Soft Maple wood finish (not a laminate), with Thin-wall bearing design allows for improved passing and shot-blocking. 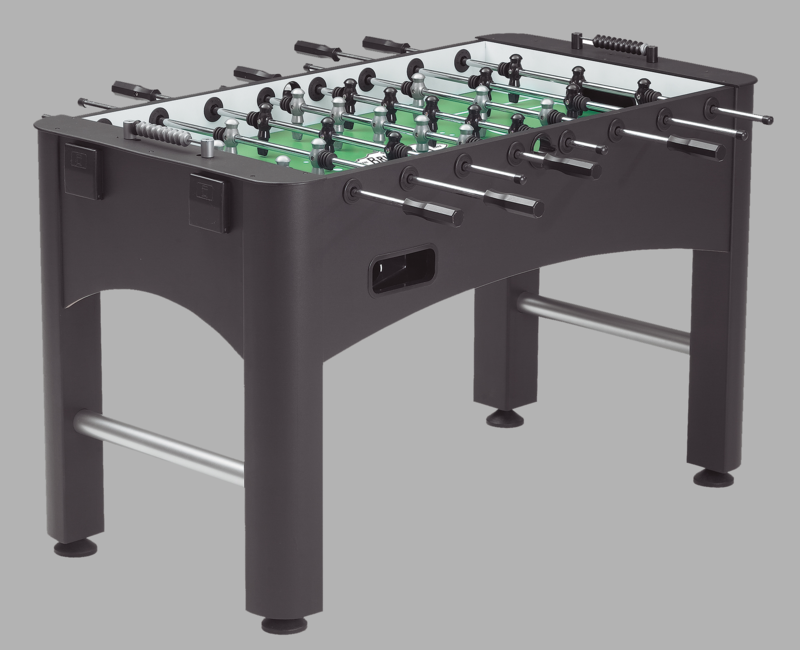 The Tornado Sport is the perfect table for both starters and the more experienced player. The height adjustment, durable construction and Mahogany Melamine finish allows for generations of enjoyment from the young, and young-at-heart. Dual End Ball Returns with SureGrip black plastic handles. The Tornado Elite table is a professional table available for the home. This beautiful table features dual ball returns, heavy gauge rods, and Tornado’s patented split bearings for easy maintenance and professional play quality. Victorian Cherry laminate finish on a 1 ½” thick cabinet. New thin-wall bearing design allows for improved passing and shot-blocking. The Tornado Reagan includes all of the Tornado quality features plus: the Solid Maple Construction, with mitered cabinet for strength. There is a Mill Creek Finish with decorative dentil molding. Adjustable leg levelers are included to change the level of the playing surface. 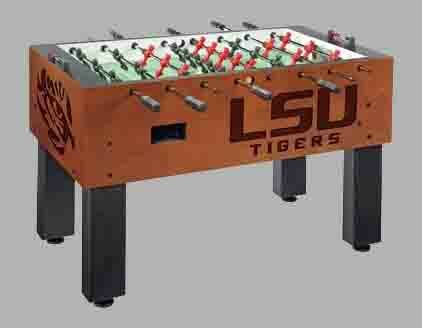 The Holland Foosball Table is laser engraved with the graphics of your choice. The playfield is regulation size and is competition ready with built in trim. Ground, plated, and polished high Tensile Steel rods come with octagonal, sure grip handles and non-binding bumpers. Players are made of automotive grade ABS material, are counter balanced, and are attached with spiral pins, all ensuring better ball control. 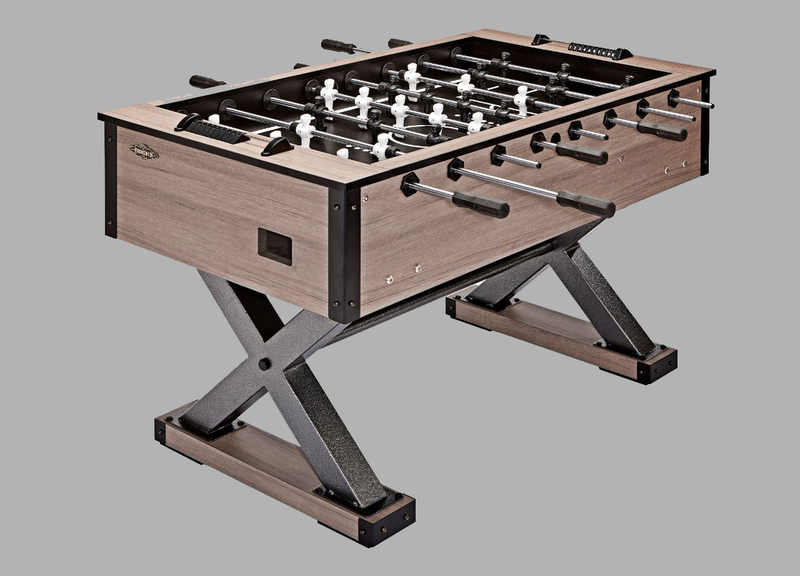 The Premier Foosball from Brunswick boasts a unique Metal X Frame giving it elegance and increased stability. 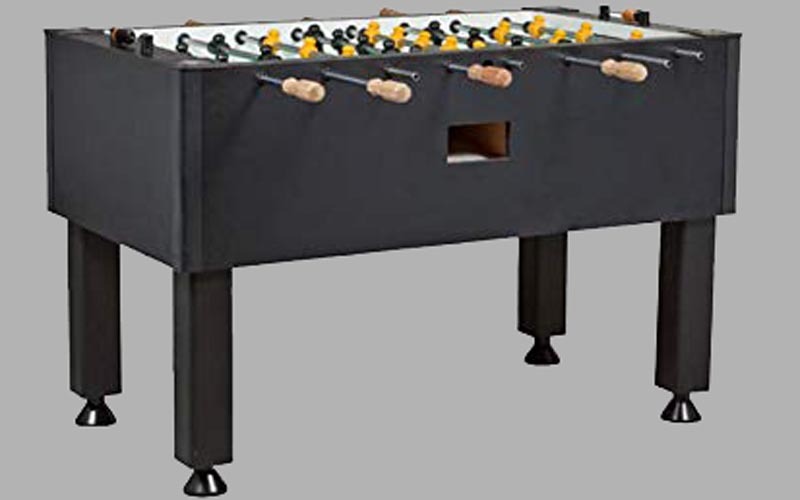 With its sturdy vinyl cabinet and melamine play surface this stunner features end ball return, adjustable leg levelers, three piece bearings and 3-man goalie for fast play. 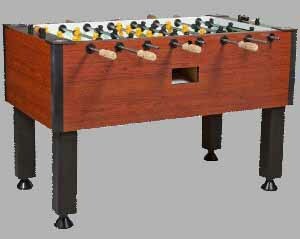 The Presidential Zoom Foosball comes in a black finish with silver trim. It features dual-sided ball returns, dual-sided ball drop entry dishes, a 3-man goalie, curved interior playing surface ends and adjustable leg levelers providing for an accurate, level playing field. 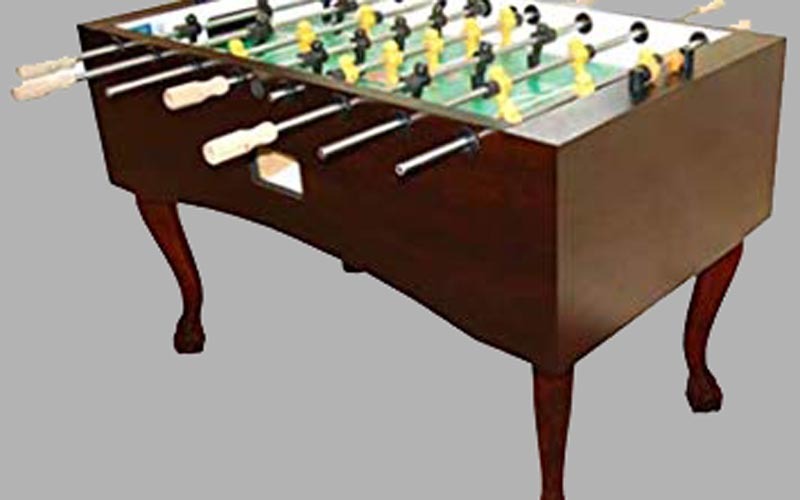 The Presidential Bolt Foosball is designed for the serious player. 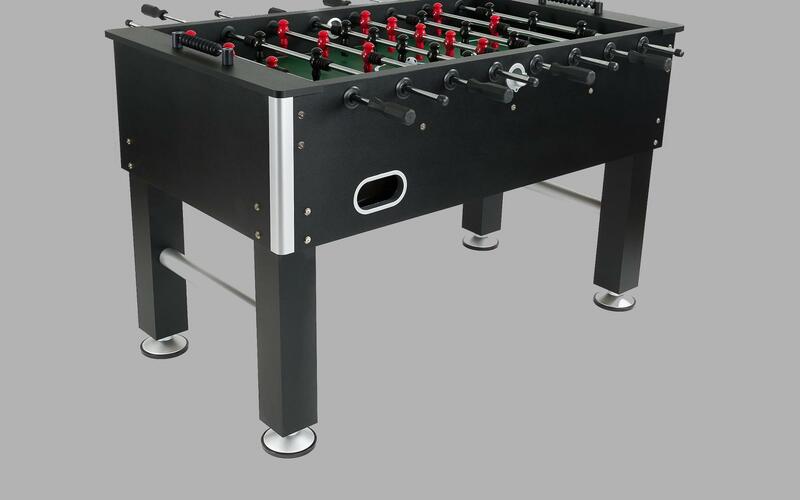 With its sleek black finish, this regulation-size foosball table has all the qualities you will find in a professional table without breaking the bank. Adjustable leg levelers, counterbalanced men, dual-end ball returns, dual-side ball entries, super grip plastic handles and a 1 inch thick cabinet are just some of its features. The Tornado Classic combines a contemporary look with heavy duty construction and many of the features found on commercial tables. The Tornado Madison includes all of the Tornado quality features plus: the Solid Maple Construction, with mitered cabinet for strength. 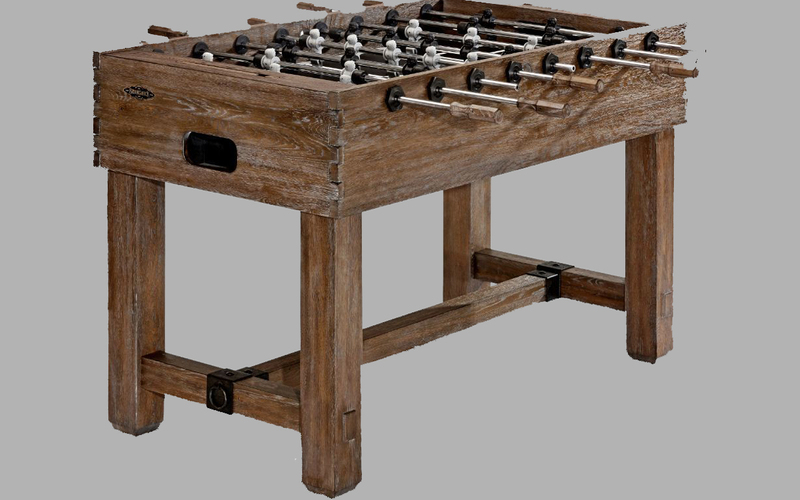 Solid Maple construction in a Rich Heritage Mahogany Finish with Ball & Claw Queen Anne style legs set this foosball table apart from the rest. Adjustable leg levelers are included to change the level of the playing surface. 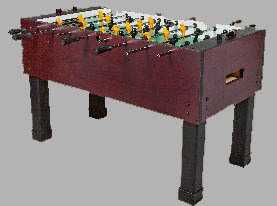 The Brixton Foosball Table from Brunswick has a distinctive X-Foundation Design. With a hand-rubbed Driftwood Finish it will compliment both the Brixton Pool Table and Shuffleboard Table to compete any game room. 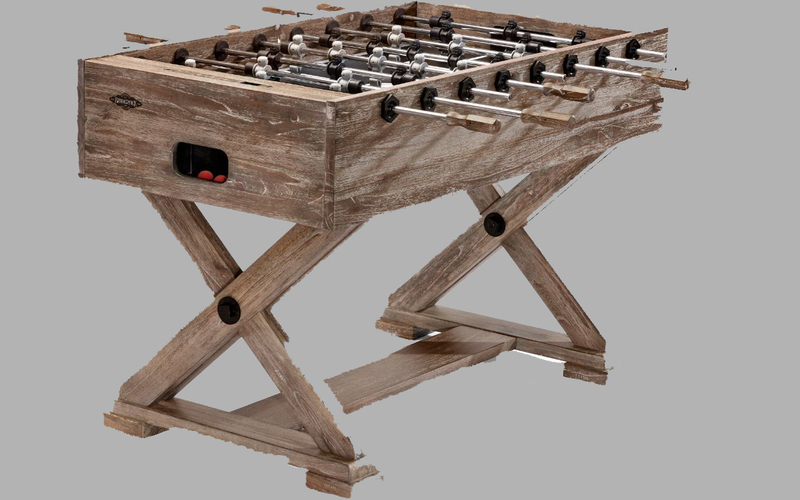 The Merrimack Foosball Table from Brunswick features a 3-man goalie for fast play, end ball returns, hammered metal hardware and distinctive joinery. The Nutmeg hand-rubbed antique finish showcases the natural grains and texture of the cabinet's rough-hewn wood matching it perfectly to the Merrimack Pool Table. Like and Follow us for Discounts and Updates!